We all know that genetics plays an important part in our outward features, but it also plays an important part in how body responds to our environment. I personally have interest in this field as I work in the medical field and see the results of genetics on a regular basis. You may ask, why would it be important for you to compile a Family Health History? Health problems like heart disease, high blood pressure, sickle cell anemia, diabetes, osteoporosis, alzheimers, and some cancers to name a few, have been noted to be familial in nature. Knowing your family's personal health history will allow you to adjust your lifestyle and health habits to encourage the best possible health outcome for you and your children. The United States Surgeon Generals website has a portion dedicated to the Family Health History. At this website they provide a web based platform where you can create your own personal Family Health History on-line. The site also provides for a small downloadable program that will complete the task on your personal computer if you prefer not to place the information on the web based platform. The site provides this information in both English and Spanish. 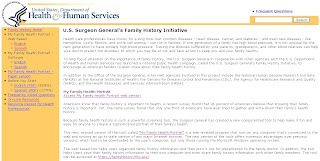 Click here to visit the United States Surgeon Generals website regarding Family Health History. The printed information is also available in Chinese, Portuguese, Polish, and French at Genomics Program. This site is sponsored by the Utah State Health Department and other information about family healthy history and genetics is available for your learning pleasure.